The Arena not has to be confiused with the Roman Theatre, which stood in front of Ponte Postumio, spreading its ample arch of stepped seating on the side of the hill behind, is still used today for summer theatrical events. 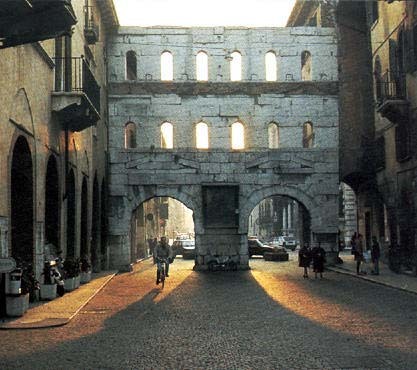 Other important remains of a very prosperous age are the Stone Bridge, the Gavi Arch and the monumental gates (Porta Borsari and the Porta Leona). These monuments are the sign of the great importance of this town in the in the Roman Age. 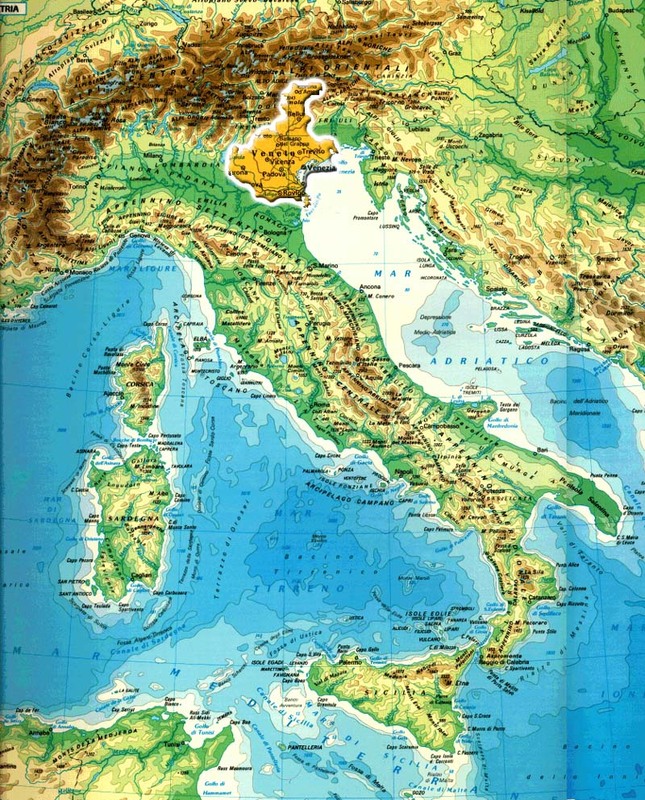 Probably founded by the Veneti, it became a Roman town in 49 B.C. It became Christian in the 4th century, till it became the beloved city of Theodoric, King of the Ostrogoth kingdom in the middie of the 5th century, then a Longobardic dukedom and the seat of Pipin, King of Italy under the Carolingian Empire. In the 11th century Verona was joined to the Mark of Bavaria and in 1136 it became a municipality. Verona was the papal seat of Pope Lucius III (Ubaldo Allucignoli di Lucca) from 1181 to 1185, the year when the Conclave which elected Pope Urban III was held in Verona. Pope Lucius III is buried in the choir of the Cathedral, where there is a memorial stone inscribed to him . Having come under the power of Ezzelino da Romano, it came under the dominion of the Scaliger family, whose seigniory lasted from 1277 until 1387, when it fell into the hands of the Viscontis. In 1405 Verona voluntarily offered itself to the Venetians, under whose government it remained until 1796, when the Republic of Venice was invaded by Napoleon. After the short-lived rule of the Kingdom of Italy Verona was occupied by the Austrians in 1814. Verona, with the whole Veneto became part of the newborn Italian Reign only in 1866. Verona is rich in Churches which, because of the works of art collected in them, are true museums of paintings and sculpture as well as being architectural monuments. In a small square, which complements it to calculated effect, is Santa Maria Matricolare, the Cathedral of Verona. Built on the site of a previous Early Christian church and consecrated in 1187, the Cathedral has a façade which is a perfect composite of Romanesque and Gothic forms. The grandiose porch, consisting of a double baldachin supported by columns resting on stylised lion figures, is particularly striking. The portal is the work of Nicolò, the same artist who was responsible for the porch of San Zeno; here he sculpted various figures, including prophets and animals, the legendary heroes dear to the Middle Ages and Biblical figures. At the sides of the porch, two large Gothic windows are cut into the façade, while above it are three rows of miniature arcades, producing a chiaroscuro of light and shade. Higher up on the facade are spires and pinnacles which create an ever lighter effect towards the top The bell-tower, the lower part of which is Romanesque, betrays the hand of Sanmicheli in the central section, while the uppert part was completed by Fagiuoli in 1926. The interior is divided into three naves, with composite pillars of red marble supporting the ponderous arcades from which the cruciform vaults diverge. The church contains numerous works of art, among them the splendid tomb of St. Agatha, created by an unknown master in 1353 and above the altar in the Nichesola Chapel, is the only work painted by Titian in Verona, the Assumption, which he did between 1535 and 1540. 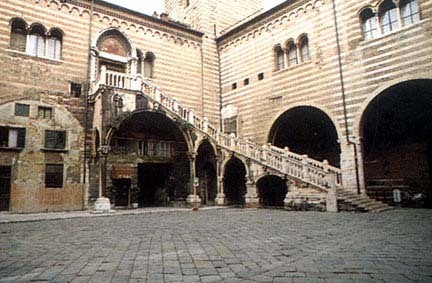 San Lorenzo, a masterpiece of Verona's Romanesque style, stands on the site of a former Early Christian church, decorative fragments of which can still be seen in the entrance courtyard. Its construction dates back to about 1117, but it was partly rebuilt in succeeding eras. Immediately noticeable from the outside are the typical alternating bands of stone and brick and the original architectural motif, of Norman derivation, of the two cylindrical towers which lead to the women's galleries. Inside the church, one is struck at once by the rigorous structural emphasis of its design. The solemnity of the Romanesque style, seen in the rhythmic order of cruciform pillars alternat- ed with double arches and supporting the women's galleries, is subtly and skilfully moderated by the play of colour in the dark and light bands along the walls, creating a some what mystical atmosphere. The Basilica of San Zeno, Romanesque masterpiece, dedicated to the patron Saint of Verona, counts among its numerous works of art a triptich by Mantegna and doors decorated with 48 bronze panels protraying Biblical scenes. Other important churches and monuments are: Santo Stefano, San Siro, the basilicas of San Zeno and San Fermo, the churches of SS. Apostoli, San Nazzaro, SS. Trinitˆ. S. Mtura">. S. Mtura">aria in Organo, Tombs of Scaligeri, Castelvecchio. Like most of the italian cities, Verona is rich in Palazzos both Medieval and Renaissance. 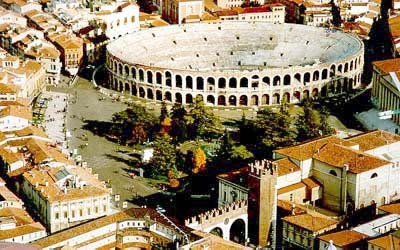 From the 1500 onwards Verona has been involved in intense building renovations, carried out mainly by private citizens. These buildings with other monuments embellished the city's Piazzas and the main streets: Piazza dei Signori, Piazza delle Erbe Via Mazzini, Piazza Bra. The name of Verona is also known throughout the world because of Shakespeare's tragedy, Romeo and Juliet. The places where, according to the tradition, the two young lovers lived and died are visited by thousands of tourists and lovers every year. Only a few paces from Piazza Erbe, at number 27 of Via Cappello, there is the Juliet's House (La Casa di Giulietta), once owned by the Dal Cappello, or Capulet, family. 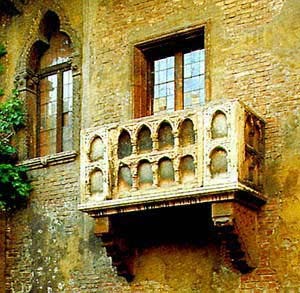 A small marble balcony records the most famous verses of Shakespeare's tragedy, in which Romeo declares his love for Juliet as she stands on the balcony. Again according to the legend, this was the house where the beautiful Juliet the most famous of all Shakespeare's heroines, lived. It probably dates back to the 13th century, and has a brick façade with large trilobate windows. Besides its monuments, Verona offers several typical products that are exported worldwide. Among them there are D.O.C. wines (with controlled specifications of origin): Valpolicella (including Recioto and Amarone, which must not be missed), Valpolicella-Valpantena (with Recioto di Valpolicella-Valpantena), Soave (with Recioto di Soave), Bardolino, Bardolino Novello, Bianco di Custoza, Lugana, Bianco and Rosso Valdadige, Valdadige Schiava, Valdadige Pinot Grigio, Tocai di San Martino della Battaglia and Lessini Durello. You can go to the area where Bardolino and Custoza are produced following "la strada del vino" (the wine road) of Bardolino, of Valpolicella and that of Custoza. The Veronese wines lead the Italian national export of doc wines (about one million hectoliters).